Jasvir Singh and Rajandeep Singh were released from the Otero County Processing Center last week almost three months after initial reports that they were among nine Sikh men on hunger strike whom ICE agents were force feeding in the El Paso Service Processing Center. El Paso and Las Cruces based community groups and national advocacy organizations launched a coordinated campaign to demand ICE cease force feeding and release the men. ICE released both men on bond after consistent pressure from local Rep. Veronica Escobar’s office and local and national advocates, and days after a Congressional Delegation from the House Committee on Homeland Security visited and toured facilities in El Paso where they examined immigration policies and operations along our southern border. Three of the men who had originally been among the nine on hunger strike remain in detention. While on hunger strike at EPSPC they reported regular physical, verbal, and psychological abuse at the hands of facility guards. Jasvir and Rajandeep sustained a hunger strike for nearly 80 days to protest their conditions and treatment in detention. They had been held in the EPSPC since November 2018. Initially they were part of a group of 13 men in the EPSPC, ten from India and three from Cuba, who began hunger striking at the end of December. Four of the men taking part in the hunger strike were deported and returned to India in early March. A fifth man who agreed to stop his hunger strike in January in return for much needed surgery, was also deported. EL PASO, TX — Immigration advocates and medical experts are deeply concerned over the ongoing hunger strike at the El Paso Service Processing Center and the dire situation facing people held in indefinite detention, especially as their health deteriorates. The “El Paso 9” have been subjected to brutal force-feedings, mistreatment and retaliatory actions by U.S. Immigration and Customs Enforcement (ICE) and private contractors following their hunger strike, which began in late December 2018. At least two of the “El Paso 9” have entered the 11th week of their hunger strike. Of the group of men who were on hunger strike or supporting the hunger strike, two have been deported, three have been transferred to the Otero County Processing Center in New Mexico, and four remain detained at the El Paso Processing Center, two of whom are still on hunger strike and are in medical isolation. “Hunger striking is a nonviolent form of protest undertaken when other means of expressing grievances are unavailable, and hunger strikers must be protected from any and all reprisals. Physicians for Human Rights calls for all precautions to be taken to ensure that hunger strikers receive needed medical attention, and that accommodations be made to ensure appropriate transport so that they are not injured. Not eating may result in lightheadedness, so wheelchairs should be provided as needed. “Extensive medical research shows that immigration detention is harmful and strongly correlated with negative mental health outcomes, while prolonged or indefinite detention violates the right to be free from torture and other cruel, inhumane, or degrading treatment. ICE has threatened the hunger-striking men with deportation despite the deterioration of their health. Immigration and civil rights groups are demanding the immediate release of the men and for them to be able to address their asylum cases outside of detention, as they should have been able to do from the beginning. Advocate Visitors with Immigrants in Detention (AVID), in the Chihuahuan Desert. Washington, DC – The Southeast Asia Resource Action Center (SEARAC), National Korean American Service & Education Consortium (NAKASEC), and South Asian Americans Leading Together (SAALT) are gravely concerned by the steps taken last night by the United States Congress and the president. First, Asian American Pacific Islander (AAPI) immigrant families are deeply disappointed with the passage of the Consolidated Appropriations Act of 2019 in both the House and Senate yesterday. We understand the immense pressure that negotiators were under to prevent another government shutdown. We similarly need to keep our government operating. Nevertheless, our organizations are alarmed at the inclusion of $1.375 billion for a physical barrier (a total of 55 miles), an 11% increase in funding for 45,274 Immigration and Customs Enforcement (ICE) detention beds, and more enforcement agents. AAPI communities have made clear that any bill including any of these measures is unacceptable. A full list of measures that AAPI communities will not stand for can be found in this letter to congressional leaders. Both the border wall and the presence of ICE are sources of terror for all immigrant communities. The wall is a symbol of hate for any immigrant living within and outside of the United States, and it directs billions of taxpayer dollars to separating families. Furthermore, the bill does not place a limit on the number of ICE detention beds nor does it restrict the authority of the Department of Homeland Security from transferring or reprogramming funding internally, which enables ICE to continue expanding immigrant incarceration and deportation at will. Second, President Trump intends to declare a “national emergency” at the border in order to justify the need for his border wall. Make no mistake, there is no national emergency happening at the border. Rather, there is a humanitarian crisis happening at the border, and it is a crisis that President Trump and his Administration caused in its entirety. The president’s intention to declare a “national emergency” is a unilateral rebuke of our democratic process driven by an irrational desire to fund an anti-immigrant unnecessary, and unpopular border wall after Congress would not approve the $5.7 billion the president initially demanded. Two-thirds of Americans do not support a national emergency. We write to express our deep and urgent concern about the treatment of Indian-Punjabi Sikh and Cuban asylum seekers detained at the El Paso Processing Center in Texas, in particular 11 of who have been on hunger strike since late December, 2018. Through nasal tubes and IV, Immigration and Customs Enforcement (ICE) officials are force-feeding nine Punjabi detained asylum seekers; six of these nine individuals have been force-fed since January. It is imperative that the Department of Homeland Security (DHS) immediately release the individuals engaged in these hunger strikes to ensure their well-being, safety, and protection of their due process rights. Just today, our organizations learned of disturbing retaliation against the strikers. An attorney representing two of the detained hunger strikers reported that ICE officials threw nine of the hunger strikers into solitary confinement for refusing to be force-fed while standing up. This follows reports on Wednesday, February 6, that ICE officials threatened four of the hunger strikers with imminent deportation, allegedly scheduled for today, February 8, 2019. A lawyer representing two of the detained immigrants informed South Asian Americans Leading Together (SAALT) that her clients’ arms and legs were tied to a chair to facilitate the force- feeding. The force-feeding tube stays in their nasal passages 24/7. On some of the individuals, the tubes are too large, causing nasal bleeding and pain. Many of the detained asylum seekers have wounds and lesions on their throats and nasal passages, are suffering from rectal bleeding and bleeding while vomiting, persistent stomach pain, and are having difficulty speaking and breathing. We are deeply concerned about their health and well-being at the hands of guards and medical staff at the El Paso Processing Center. On January 30, 2019 an Associated Press article detailed the story of detention center staff force-feeding Cuban and Punjabi asylum seekers who have been on hunger strike to protest their prolonged detention and denial of bond at bond hearings after passing credible fear interviews. This latest strike represents an escalation of pervasive and historically discriminatory behavior against South Asian asylum seekers in particular, that has been extended to Cuban asylum seekers in this case and across various populations. The detained immigrants have also been subjected to prolonged psychological abuse by ICE and detention staff. They are being denied religious accommodations and are routinely threatened with deportation, segregation, and solitary confinement. We believe these threats are a form of retaliation for drawing attention to their cases through the hunger strike. Lastly, the asylum seekers are being denied adequate language access inside the facilities regarding their legal rights and due process. All detention facilities have an obligation to provide language interpretation under Title VI of the Civil Rights Act and Executive Order 13166 and under the ICE’s Performance Based National Detention Standards 2011 (rev 2016). Our organizations and many others have documented egregious, dangerous, and punitive conditions experienced by hunger strikers in detention facilities across the country, particularly in the El Paso Processing Center and Adelanto Detention Facility. Asylum denial rates in El Paso and neighboring New Mexico, where some of the hunger strikers’ cases were heard, areamong the highest in the country. The current El Paso immigration judges average about 95% for denials of asylum, with one judge not awarding asylum in the last two years. Additionally, El Paso and southern New Mexico immigration judges routinely deny bond, resulting in prolonged detention for many residents in the detention facility. From 2014 through 2018, organizations have documented several instances of damaging and inhumane treatment of asylum seekers on hunger strike in the El Paso Processing Center and others across the country. El Paso, TX: In 2014, the Sikh Coalition filed a complaint (No. 14-07-ICE-0183) with the DHS Office of Civil Rights and Civil Liberties (CRCL) about the treatment of 37 Punjabi asylum seekers detained in the El Paso Processing Center for over one year. All of these asylum seekers passed their credible fear interviews and were denied bond or parole and went on hunger strike to protest their prolonged detention. They too received inadequate medical care, retaliation for their hunger strike, and no language interpretation. In the end, many of them were deported. In 2015, Desis Rising Up and Moving (DRUM), The National Immigration Project of the National Lawyers Guild (NIP-NLG), and South Asian Americans Leading Together (SAALT) filed a complaint (No. 16-01-ICE-0012) with CRCL about the treatment of these 54 asylum seekers. In early 2017, we were informed the findings of a CRCL investigation were turned over to ICE for further action. We have followed up several times for the findings of these investigations and have been given no update. Adelanto, CA: An asylum seeker from Nicaragua detained in the Adelanto Detention Facility committed suicide in 2017 and seven more detained immigrants attempted suicides between October 2016 and July 2018. This follows the death of five asylum seekers from Mexico, El Salvador, and Honduras over the last three years alone in Adelanto, resulting from medical neglect despite repeated requests for medical attention from detained immigrants. In June 2017 nearly 40 detained immigrants from Guatemala, El Salvador, and Honduras launched a series of hunger strikes to protest their conditions and treatment and faced severe retaliation. In May, 2018 the DHS Office of the Inspector General conducted a surprise visit of the facility and concluded that it was violating ICE’s own detention standards. On August 15, 2018, a delegation of Members of Congress from the Congressional Asian Pacific American Caucus, led by Chairwoman Judy Chu, raised further questions about hunger strikes, retaliation, and woefully inadequate medical care of detained immigrants in the Adelanto Detention Facility. Sheridan, OR: In June, 2018, 70 South Asian detained immigrants in the Yamhill County Federal Prison were denied access to counsel, language interpretation, and religious accommodations. Some Sikh detained immigrants were even forced to cut their hair. Folkston, GA: Also in June, 2018 over 100 South Asian asylum seekers at the ICE Processing Facility in Folkston, GA began a second hunger strike to protest their prolonged detention. Once again, after passing credible fear interviews, the asylum seekers were denied bond by immigration judges. DHS allegedly visited the facility in August, 2018, but there has been no update on the findings of this visit. Victorville, CA: Also in June, 2018 nearly 400 South Asian asylum seekers were held in the Federal Correctional Institution in Victorville, CA. Many of the asylum seekers were Sikh and banned from wearing their turbans and denied other religious accommodations and adequate medical care at a facility notorious for its scabies and chicken pox outbreaks. The detained immigrants were also denied legal counsel and their cases were on indefinite hold. Release the hunger strikers and provide them with immediate medical attention. Release the court order authorizing ICE or DHS officials to engage in force-feeding the detained immigrants in the El Paso Processing Center. Conduct an unannounced inspection by the DHS Office of the Inspector General. Conduct immediate independent monitoring of the El Paso Processing Center while investigations are carried out into allegations against medical staff and guards, including the review of facility video footage that documents incidents of abuse and mistreatment. Release the findings of the 2015 CRCL investigation into treatment of hunger strikers and violation of Title VI provisions in the El Paso Processing Center to the complainants within 14 days. Conduct an investigation to assess how ICE complies with Title VI provisions relating to language access in the El Paso Processing Center and nationwide across all detention facilities. Release the findings to the public within 30 days. Immediately conduct an investigation of bond and parole processes, including whether people are released, in the El Paso Processing Center and nationwide across all detention facilities. Release the findings to the public within 30 days. El Paso, Texas — The nine Sikh asylum seekers on hunger strike in the El Paso Service Processing Center (EPSPC) have been thrown into solitary confinement after refusing to be force-fed standing up, reports their attorney after speaking with a family member. Immigrant rights advocates, civil rights organizations, and local community groups are deeply alarmed by this latest development involving the nine Sikh asylum seekers who have been on hunger strike for more than 40 days to protest their incarceration at the EPSPC. Immigration and Customs Enforcement (ICE) has responded with abusive retaliation, including force-feeding at least nine of the asylum seekers, a cruel, degrading and inhumane practice. ICE agents also threatened the asylum seekers with deportation as early as Friday morning. Amrit Singh, the uncle to two of the Sikh asylum seekers on hunger strike, attempted to put money into the commissary accounts of three of the strikers and money was returned back to his card. This development is particularly alarming because ICE frequently cuts off detainees’ phone accounts prior to deportation. Since May 2015, Freedom for Immigrants has documented nearly 1,400 people on hunger strike in 18 immigration detention facilities. A troubling pattern as President Trump continues to expand the detention system to skyrocketing proportions, leading to an increase in abuse and death. Since March of 2018, AVID volunteers have been collecting reports of large numbers of detained South Asians hunger striking at both EPSPC and the neighboring Otero County Processing Center. Detained Migrant Solidarity Committee (DMSC) is a community group based in El Paso, TX, that fights to free the border from the criminalization and mass incarceration of migrants. We aim to reach this goal through support services, organizing, and actions that promote more humane public policy and respect for migrants and other marginalized communities. South Asian Americans Leading Together (SAALT) is a national, nonpartisan, non-profit organization that fights for racial justice and advocates for the civil rights of all South Asians in the United States. Detention Watch Network (DWN) is a national coalition of organizations and individuals working to expose and challenge the injustices of the United States’ immigration detention and deportation system and advocate for profound change that promotes the rights and dignity of all persons. Founded in 1997 by immigrant rights groups, DWN brings together advocates to unify strategy and build partnerships on a local and national level to end immigration detention. Visit www.detentionwatchnetwork.org. Defending Rights & Dissent (DRAD) is a national civil liberty organization that strengthens our participatory democracy by protecting the right to political expression and working to make the promise of the Bill of Rights a reality for everyone. DRUM – Desis Rising Up & Moving organizes low income South Asian and Indo-Caribbean immigrants, workers, and youth in NYC for educational, immigrant, racial, worker, and gender justice. National Immigration Project of the NLG promotes justice and equality of treatment in all areas of immigration law, the criminal justice system, and policies related to immigration. We provide technical assistance and support to legal practitioners, immigrant communities, community-based organizations, and all advocates seeking and working to advance the rights of noncitizens. South Asian Americans Leading Together (SAALT) is deeply disturbed by reports of staff at the El Paso, TX detention processing center force-feeding mostly Indian and Cuban detainees in the midst of a hunger strike. Up to 30 detainees, the majority of whom have pending asylum claims, went on a hunger strike after verbal and psychological abuse at the hands of ICE and detention center staff at the notorious El Paso facility. These horrifying reports are only the most recent in a series of unaddressed civil rights violations reported at the El Paso facility since 2015, at which point SAALT, along with other organizations, pursued legal action. In 2015, mostly Bangladeshi asylum seekers at the El Paso facility went on hunger strike to protest the indefinite delays in their cases after passing “credible fear” interviews, an initial and important step in the asylum process. SAALT, Desis Rising Up and Moving (DRUM), and the National Immigration Project of the National Lawyers Guild filed an official civil rights complaint with the Department of Homeland Security (DHS) over treatment of the asylum seekers. DHS has yet to address the civil rights violations at the El Paso facility reported in 2015, and now more asylum seekers face violence and abuse. Since 2015, SAALT has also documented reports of South Asian detainees in additional facilities in Oregon, California, and Georgia who have gone on hunger strikes to protest prolonged detention, denial of legal counsel, and a range of civil rights violations from providing inadequate medical care to withholding language interpretation to denying religious accommodations. 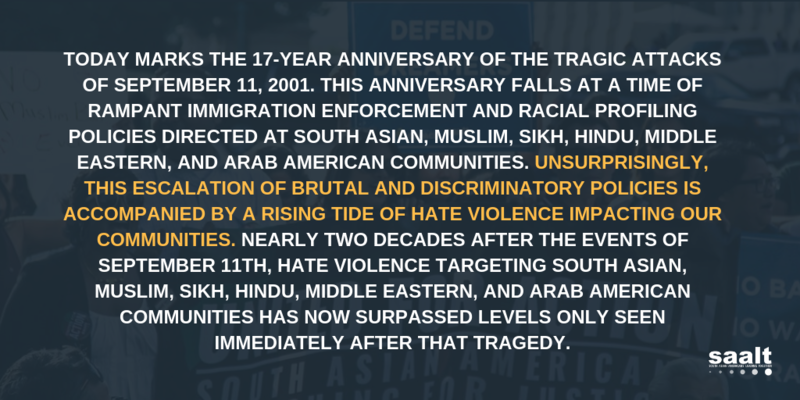 SAALT is a national, nonpartisan, non-profit organization that fights for racial justice and advocates for the civil rights of all South Asians in the United States.